It's time. To talk. About my love for Shake Shack. Luckily, this burger place has more than one location, including one in Times Square (44th and 8th) and one on the Upper West Side (77th & Columbus), so I can technically get it when the craving arises (which it does quite often). 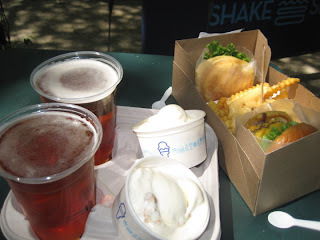 BUT the second part of why winter needs to end is because there is *nothing* like hanging out in Madison Square Park (23rd & Madison) at the original location of Shake Shack, which is just a little hut/burger stand in the middle of the park with a line no shorter than an hour on a sunny day. But what did I tell you about lines to food places? It is SOOOOOOO worth the wait. Anyone who says otherwise about Shake Shack is just not my friend. This burger is my friend. I love Shake Shack so much that all I wanted for my birthday last year (aside from a three-night long celebration) was a day off from work to go shopping and get burgers, beers, cheese fries, and ice cream with Nicole. 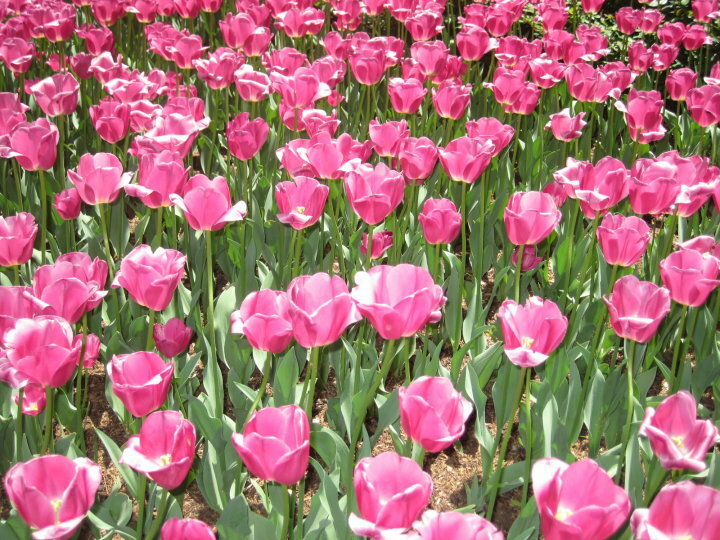 We waited in line for a good two hours that day and got to see an Arbor Day celebration going on in the park with Carmen Electra as master of ceremonies. For some reason, her agent thought this was a good idea for her, although the gig included shaving men's chests for charity. 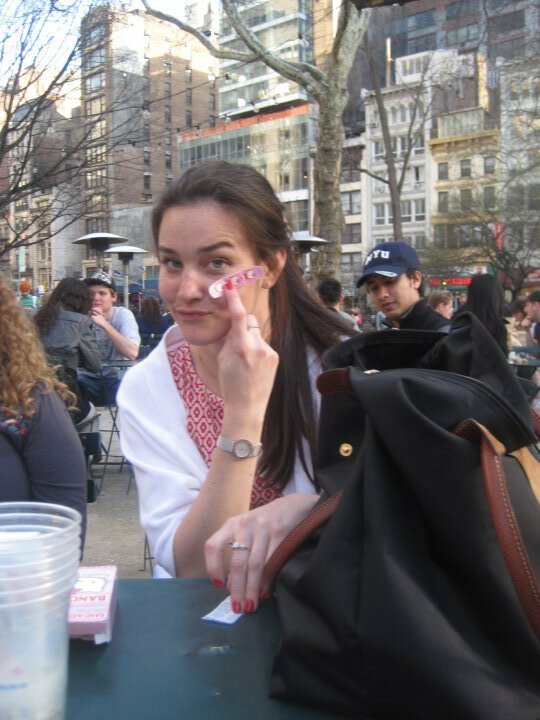 Shake Shack was also where Nicole and I went for our celebratory dinner when we signed our lease for our apartment. Shake Shack was actually the first restaurant in New York City that I took my parents and sister to when they came to visit and the first restaurant my cousins Christie and Emily and I went to on Christie's first NYC visit although we were shivering while eating our ice cream as it was not really nice enough yet. I also made sure to take one of my besties from home, Aubrey, on one of the first infamous weekends she visited (PS - Aubs, time for you to visit again!!). 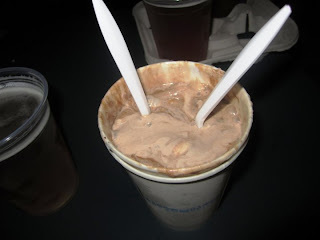 On that particular occasion, the line was about three hours long, so we chose to go to the convenient "B" line where you are allowed to order beers, concretes (above pic - "dense frozen custard with mix-ins"), and custard. Nicole, Rachel, and David (are you still reading this?!) also joined us that day along with another friend from home and his buddies. We played drinking games (with Disney Princess playing cards that were well worth the extra 50 cents at Duane Reade) in the park for a very long time and it turned out to be one of my favorite Saturdays last year. Shake Shack has monthly custard specials, a different one for each day of the week. For example, on Wednesdays in January, it is Carrot Cake. My favorite flavors have been Fluffernutter, Red Velvet Cake, and, hold on to your hats for this one, Pancakes and Bacon. It was incredible as you can see from the picture. Go before the lunch rush or before the dinner rush or late night! 11, 3:30, and 9 are good times. Check the website because there is a "Shack Cam" where you can see how long the line is. If there is a long line, have someone stand in it, then have someone go to the "B" line and grab beers, sodas, and/or Arnold Palmers for the wait. Always ask to sample the custard-of-the-day when you order, even if you don't plan on getting any. Grab a table ASAP and hold on to your chairs. Bring a deck of cards and get two beers at a time (the limit per transaction). There is nothing to hate about this place. Except for the line, if you don't know what you are getting at the end. If you know, you are totally okay with waiting. Trust me. 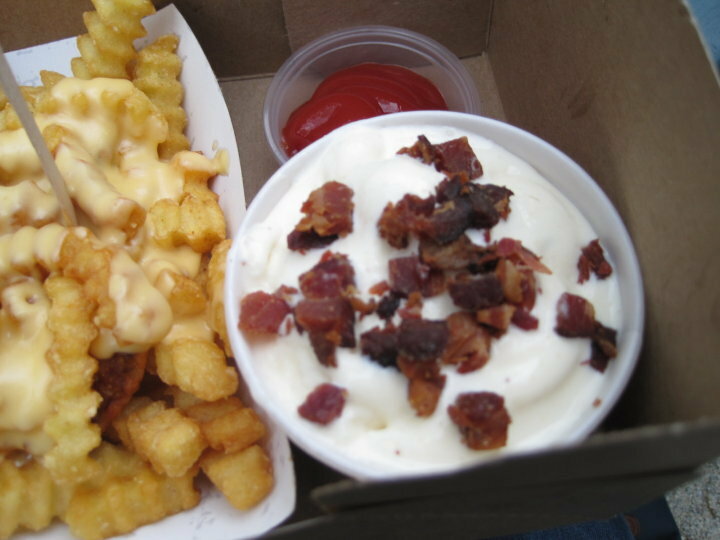 Omg, shake shack is my favorite place ever! There's one on 86th and Lexington, and its nearly impossible to walk by without wanting to run in and inhale all the burgers. 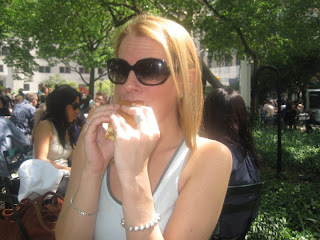 Spring needs to come bc Shake Shack + sunshine may in face = HEAVEN.